We are the UK's only official retailer of Pac-Man's Pixel Bash machines. Lowest prices guaranteed, backed by award winning service. Visit our showroom to find out more. Pac-Man is the world's favourite and best remembered arcade game and has a culture of its own, complete with merchandise from key chains and stress balls to wall decals and furniture. We are as passionate about Pac-Man as the rest of the world seems to be! This simple but addictive classic arcade game is the basis of Namco's new arcade machine: Pac-Man's Pixel Bash. We are very proud to stock the official Namco Pac-man's Pixel Bash machines, for which we are the only official UK retailer. These machines are really great fun, and with over 30 vintage arcade games you can re-live the thrill of the classic arcade games from the past on an authentic Namco machine. These fantastic machines are great fun for friends and family to gather round and watch one or two players battle against each other and beat their high scores. These arcade machines are perfect for player of all ages as older players will be playing with nostalgia, while younger players will be discovering these games for the first time. These Pac-man's Pixel Bash retro arcade machines hold an exciting range of games including Pac-Man, Ms. Pac-Man, Galaga, Dig Dug, Galaxian, Pac-Mania, Galaga '88, Mappy, Xevious, Rolling Thunder, Dragon Spirit, Rally-X and Bosconian. These games are all classics and will provide you and your family and friends with endless entertainment, with all the thrill of being in an arcade without ever having to leave your house. The menu systems are easy to use and you can set all parameters such as difficulty, number of lives, extra life options. You can even control the shot speed in Galaga - something that will keep the gaming geeks among us happy! Pac-man's Pixel Bash comes in two versions; the coin-op version for charging per play, and the home version for unlimited freeplay gaming. 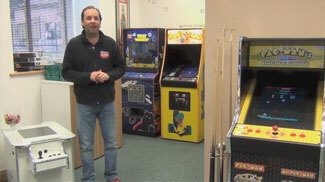 We always have a great range of arcade machines in our Bristol showrooms, so why not pop in and try them out? These machines are usually in stock and will take 7 to 10 days to be delivered. Delivery is included for free. We will bring the machine into your house, plug it in and set it up for you, and even take away all the packaging, leaving you ready to enjoy many hours of gameplay on this classic arcade machine.